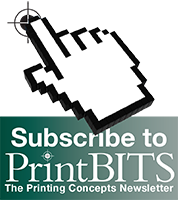 PrintBITS: April 2013 - Printing Concepts, Inc.
Building on the success of digital printing, we have focused our efforts on delivering short run digital finishing products with the new Kongsberg i-XE10 (we call it the ESKO). The ESKO offers digital finishing solutions, such as scoring, kiss-cutting (for labels), and die-cutting for hundreds of substrates with speed and precision. Through the efficient and versatile finishing solutions offered by ESKO, we can focus on the conceptual language of visual communication devices. –>>Watch a video of our ESKO in action. Die cutting is a relatively inexpensive way to “push the envelope” when creating unique effects with your projects. A die-cut element draws attention to the 3D nature of paper and the character of the material itself. It will accentuate design elements and add fresh, new life to your work. Die cutting is mostly used as a feature – taking an industrial process and turning it into a creative component. As an offset and digital print shop, we find a myriad of ways to utilize die-cutting. –>>Discover creative ways to use die-cutting. This April, Patrick Callahan joined the Printing Concepts team as an Operations Manager. Coming from Chicago, Patrick has devoted most of his career to the printing business, both in a commercial offset and digital printing atmosphere. A dynamic industry, printing has numerous unexpected projects and unique schedules that need almost around the clock attention. Patrick Callahan brings his knowledge and understanding of the printing industry to Printing Concepts to ensure a complete and seamless integration of our unique and time demanding projects. Read about him below in an Interview with Patrick Callahan.